Atlanta’s history is rich with stories of triumph, failure … and new beginnings. Ponce City Market, a building that’s playing a vital role in transforming Old Fourth Ward and the surrounding neighborhoods of Midtown and Virginia Highlands, is a perfect example. 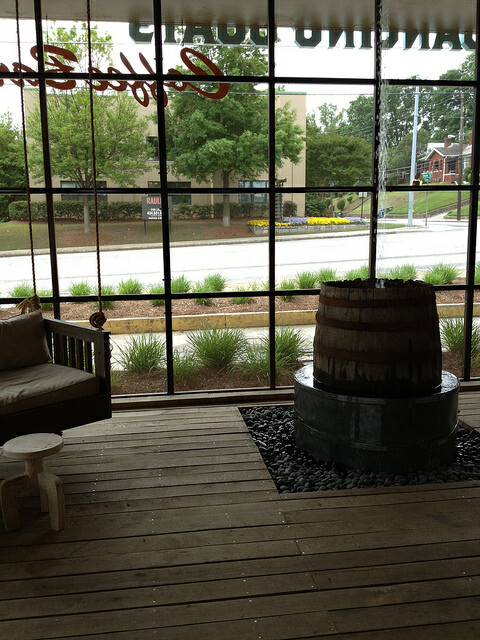 This once-abandoned building is a key player in the redevelopment of one of Atlanta’s oldest neighborhoods. 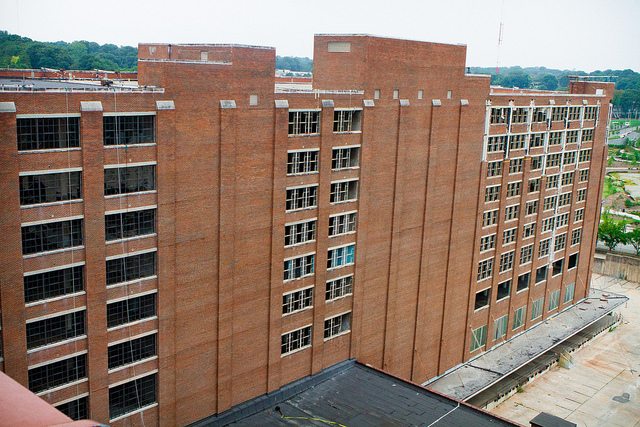 In this article, we’ll discuss the history of both Ponce City Market and Old Fourth Ward, sharing ideas on how the redevelopment of the former Sears distribution center is fundamentally changing Intown Atlanta. In 1926, Sears, Roebuck & Co. was one of the nation's leading consumer goods companies. At the time, a substantial proportion of the company’s orders came through their catalog. In order to process their catalog orders, Sears, Roebuck & Co. opened a gorgeous brick building on Ponce de Leon Avenue. This 2.1-million-square-foot brick building (roughly 45 acres of floor space) is the largest building in the South. The site is unique because it is actually the crossroads for four core Intown neighborhoods: Virginia-Highlands, Poncey-Highland, Midtown, and Old Fourth Ward. During the company’s heyday, Sears used this beautiful feat of architecture as a shipping center. The retail store closed in 1979, but Sears maintained the building as a regional office until 1987. Unfortunately, the Sears building fell into disuse and abandonment. From 1987 to 1990, the building saw little activity. In 1990, the City of Atlanta purchased the building for $12 million. The city planned to house more than 2,000 police and fire employees in this space, as well as rent out sections of the building to county, state and federal agencies. They also established a city-funded art gallery on the ground floor. While the city successfully moved some of their police and fire department offices into the building, the majority of the space remained unutilized or underutilized. Finally, in mid-2010, the building officially fell vacant. The city closed the building to the public, and this behemoth-sized space sat empty. The story of the Sears building mirrors the story of the neighborhood in which it sits, Old Fourth Ward. Both flourished, then fell into decline, and are now experiencing a comeback. Old Fourth Ward was once a thriving and wealthy neighborhood. It’s main thoroughfare is Boulevard Avenue, which runs through the heart of the city, connecting Oakland Cemetery (located on Moreland Ave near its intersection with Boulevard) to Piedmont Park (which starts at the corner of 10th Street and Monroe Drive). Boulevard runs through Cabbagetown, Sweet Auburn, the Highlands, Old Fourth Ward and ends in Midtown, where it changes names to Monroe Drive. In the early 1900’s, Boulevard Avenue was the most desirable residential street in Atlanta. Elegant mansions lined the street, particularly around Boulevard’s intersection with Ponce de Leon. Unfortunately, the Great Atlanta Fire of 1917 destroyed Boulevard’s beautiful homes. The fire, which stretched from Cabbagetown through Midtown, forever changed the landscape of Old Fourth Ward. Most of the burned-down mansions along Boulevard and Ponce were replaced by cookie-cutter brick apartment complexes. As the wealthier residents started moving away, Old Fourth Ward became a barren landscape of abandoned buildings and boarded-up windows. Old Fourth Ward steadily declined from the 1960s into the 2010s. Properties along Freedom Parkway were razed to make space for a freeway that was never built. What was once a densely populated neighborhood of 20,000 residents was soon only home to 6,000 people. Major areas of Boulevard sat vacant for most of the 1970s. At the same time, there was a shortage of low-income affordable housing in the country. To remedy this problem, Congress passed the Housing and Community Development act of 1974, known today as the Housing Choice Voucher Program Section 8. In response to this subsidized program, Gerald Schuster, the CEO of a Boston-based company called Continental Wingate, bought the majority of the blighted and run-down properties along Boulevard. He turned these old buildings into Section 8 apartments. Continental Wingate owns more than 700 units along Boulevard, all of which are federally subsidized. Boulevard became the largest concentration of Section 8 housing in the southeast, and Old Fourth Ward became an area that represented Atlanta's highest concentration of poverty. From the 1970’s through 2010, Boulevard became one of the most neglected neighborhoods in the city. Until just a few years ago, Old Fourth Ward -- and particularly Boulevard Ave. -- was a notorious hotspot for crime, drugs, prostitution, and gang activity. It was not a safe place, even for the residents. How does the history of Old Fourth Ward relate to Ponce City Market? As you can see, both the Sears building and the neighborhood in which it’s located once enjoyed a prosperous heyday. But both the building and the neighborhood fell into subsequent decline. Their fates mirror one another. Today the building is making a resurgence. And alongside this, the neighborhood is also enjoying a comeback. In 2011, a private-equity group called Jamestown Properties bought City Hall East from the City of Atlanta for $27 million, which included an initial $15.5 million payment at closing. Their purchase also allowed the City of Atlanta to stop spending $600,000 per year on maintenance and operating overhead for the abandoned building. Jamestown Properties is the same group that developed the Chelsea Market in New York, a mixed-use food hall, shopping center, television production center and office building that’s housed in the former Nabisco factory where the Oreo cookie was invented. The Jamestown Properties managing director stated that they envision Ponce City Market developing into a major economic hub, mirroring the success of the Ferry Building in San Francisco, Pike Place in Seattle, and their own Chelsea Market in New York. They rebranded the former Sears building (and former City Hall East) as Ponce City Market. These developers sought to turn the vast historic site into a mixed-use development of residential lofts, retail space, offices, and restaurants. The developers are dedicating 300,000 square feet of retail space on the first and second floor levels. This space will feature a mix of national chains and local businesses. They’re also devoting 500,000 square feet of space to Class A office space, as well as many residential dwellings that range from studios to three-bedrooms. Jamestown, along with its sustainable development subsidiary Green Street Properties, is also building multiple walking paths that create direct access from the property to the Beltline, which runs next to Ponce City Market. In the short-term, this created a boom in construction-related jobs in the neighborhood. In the long-term, city officials estimate that the redevelopment of Ponce City Market will create an economic impact of more than $1 billion over the next 10 years. Jamestown Properties succeeded. Ponce City Market officially opened on August 25, 2014, although the building opened piecemeal (one section at a time). The Dancing Goats coffeeshop became the first space open for business. Dancing Goats, which features fair-trade coffee, fresh-baked goods and a large screened “front porch” area, instantly became popular among neighborhood residents. Most mornings it’s bustling with activity. Ponce City Market is now in the process of opening additional stores, office spaces, bars, restaurants, and fitness studios. The former Sears’ distribution center is becoming a center of commerce, art, and economic prosperity. As Ponce City Market grows in popularity, the surrounding neighborhood -- Old Fourth Ward -- is also experiencing a revitalization, thanks to this media attention and economic activity. 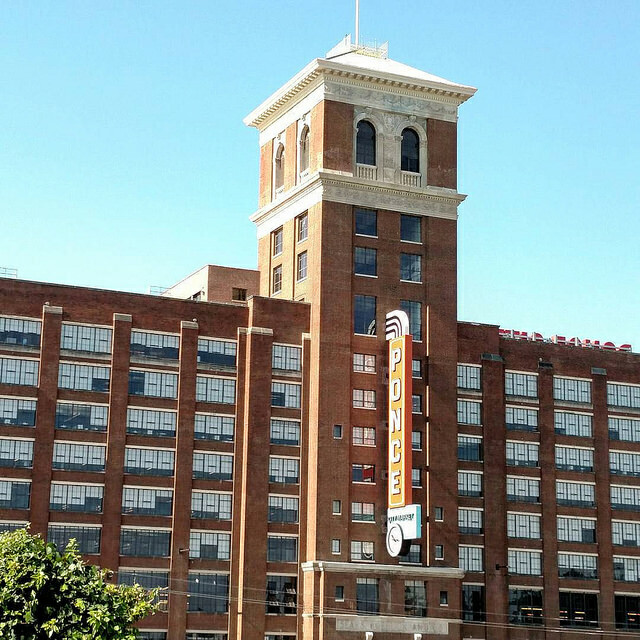 Ponce City Market and the Old Fourth Ward are mutually helping one another revitalize. Old Fourth Ward has become “the next Brooklyn.” It’s hip, it’s cool, and home values are skyrocketing. 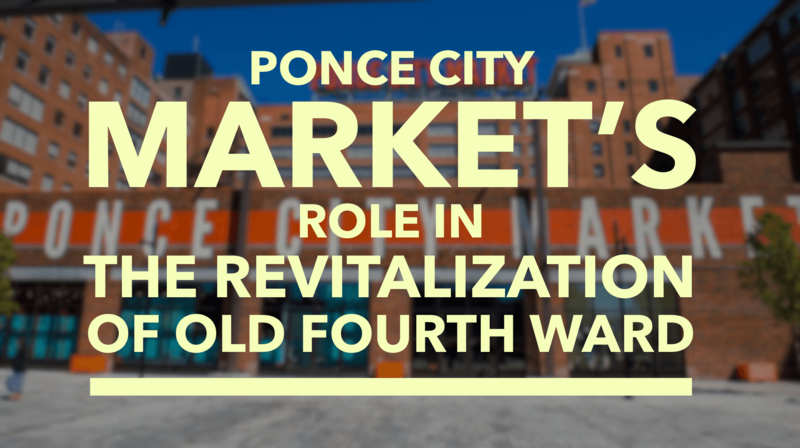 The revitalization of Ponce City Market plays key role in the revitalization of Old Fourth Ward. In addition, the opening of the Atlanta Beltline, specifically the Eastside Beltline Trail (which runs next to PCM), is also playing a crucial role. The Beltline creates a pedestrian-friendly and bike-friendly pathway that stitches together the Intown neighborhoods. Together, the Beltline and Ponce City Market have begun to revitalize the Ponce de Leon Avenue corridor. These two factors have forever changed the once- economically distressed Old Fourth Ward district. Old Fourth Ward is quickly becoming a safer and more prosperous area to live. This isn't just a story about a building coming back to life. It's a story about an entire neighborhood (and City) coming back to life. 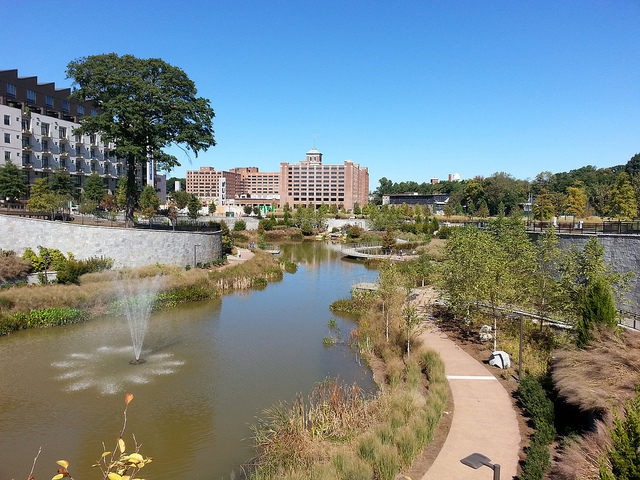 Ponce City Market and the Beltline have played a key role in revitalizing Old Fourth Ward. This area now houses families of all income levels and features a booming real estate prices. This neighborhood of poverty is now a neighborhood of hope, economic success and artistic expression. College students, families, and young professionals now call the iconic building home. New restaurants and storefronts are opening every day. Businesses are flourishing. People are no longer afraid to walk down Ponce de Leon Avenue. The Beltline connects Ponce City Market and Old Fourth Ward to the surrounding areas of Atlanta, linking people not just physically, but with the promise of prosperity as well. Ponce City Market has helped a diverse group of people and businesses embrace Old Fourth Ward as their home. The once-abandoned Sears, Roebuck and Co. warehouse is now open for business.